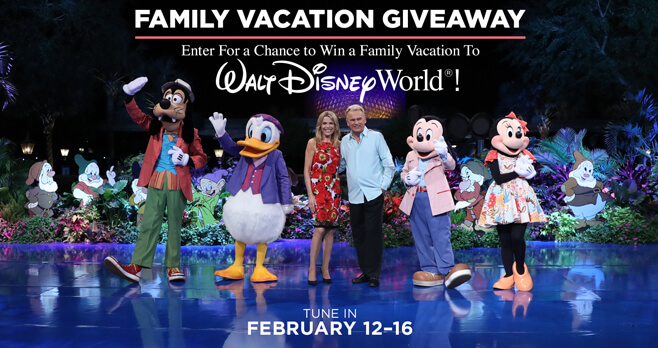 Starting on February 12, watch Wheel Of Fortune for the Bonus Answers and a chance to win a family vacation to Walt Disney World Resort. Enter the Wheel of Fortune Family Vacation Giveaway 2018 daily through February 17.
Who Can Enter? The Wheel of Fortune Family Vacation Giveaway 2018 is open only to permanent legal residents of the 50 states of the U.S., or D.C. (excluding Guam, Puerto Rico and all other U.S. and foreign territories and possessions), who are currently physically located and residing therein, and who are 18 years of age or older as of February 12, 2018. When To Enter? Sweepstakes begins at 3:00:00 p.m. PT on February 12, 2018 and ends at 2:59:59 p.m. PT on February 17, 2018. What Is The Family Vacation Giveaway Prize? The Grand Prize consists of a trip for four to the Walt Disney World Resort. Who Are The Wheel of Fortune Sweepstakes Winners? For the Winners List, send a self-addressed, stamped envelope (with proper postage affixed) to: Wheel of Fortune Family Vacation Giveaway II Winners List, P.O. Box 6735, Burbank, CA 91510. I wanted to see all the answers to the February 17th Wheel of Fortune show. can you give to me? .